Since my son was born almost three years ago, I have unfortunately been up at the crack of dawn nearly every weekend. Over the past year or so, a family tradition has arisen - every saturday and sunday morning, my son and I fix breakfast for ourselves and for momma, who gets to sleep while the cooks are in the kitchen. The only criteria is that the breakfast has to be something special that doesn't get eaten during the week - so no toast or cereal. Most often, we make pancakes or waffles, sometimes with bacon if we have some. Occasionally we will make muffins or coffee cake. These types of recipes work well with a toddler as sous chef because they involve three simple stages - mixing dry ingredients, mixing wet ingredients, and stirring them all together. Thus, there are plenty of opportunities for my son to help out (see picture). One of my son's favorite weekend breakfasts are popovers. They come out of the oven looking and tasting impressive, but they couldn't be easier. The only problem is that, unlike pancakes, you have to wait awhile for them to cook, which can be difficult. But once they do they are well worth it. Put a 12-cup muffin tin in the oven and preheat to 450. Combine the dry ingredients and the wet ingredients separately, then stir them together quickly - just until they are combined, the batter doesn't have to be 100% smooth. Remove the muffin tin from the oven (careful, that thing is hot!) and brush them thoroughly with melted butter, or a neutral oil. Pour the batter in each cup until about 2/3 full. I find this will fill about 9-10 cups. Bake at 450 for 15 minutes, then reduce the heat to 350 and bake for another 20 minutes. During this time, do not open the oven - if you don't have an oven window then you will just need to have faith that they are cooking properly. When finished, remove quickly from the tin and put them in a basket, wrapped in a towel. They really need to be eaten warm (read: as soon as possible) so you want to keep them from cooling. When done right, they should puff up high above the tin they are baked in, with a crunchy browned exterior and a soft, eggy interior. The exterior should be browned and firm and cooked enough to maintain its shape even when you pry them out of the muffin tin. If they are undercooked they tend to deflate when you remove them - they still taste great, but don't have the pleasing puffed up shape. Of course, cooking times may vary by oven, so if you find that they are overdone or underdone according to my timing above, then adjust accordingly. They can be eaten just plain, with a little salt or with honey or maple syrup. Also, for a variation try sprinkling some grated cheese on the batter in each cup right before it goes in the oven. My son refuses to eat them with cheese, but I think most people will like it. 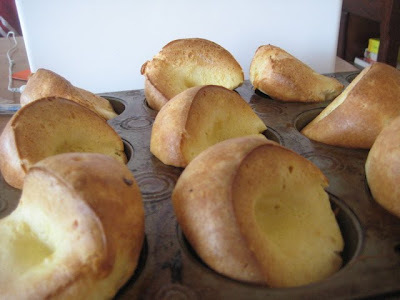 As a note, a large single popover cooked for a crowd is called a yorkshire pudding, and is a traditional accompaniment for prime rib or a similar meat dish. But that is a subject for another post. In what kind of tin would you cook a communal popover?